Want to see more than just the French Quarter on your next trip to New Orleans? The banks of the Mississippi River, skirting the oldest part of the city is the perfect place for a walking tour whether you're traveling alone, or with your family. "Old Muddy" is the lifeblood of New Orleans and also provides sights and activities for all ages and budgets. The New Orleans riverfront is easy to find from the French Quarter, convention center or downtown. If you are staying in the French Quarter, find your way to Jackson Square to begin your tour. Jackson Square is in front of the St. Louis Cathedral and is surrounded by artists and fortune tellers. If you are starting at the convention center, you can do the tour in reverse order. The walk from Jackson Square to the convention center can take an hour or a day depending on how many times you stop and what you choose to do along the way. Pass up the usual breakfast chains and walk across Decatur Street from Jackson Square to the Café Du Monde. There you should indulge in one of the signature treats of New Orleans, beignets (ben-yeas), a light puff of French pastry covered with powdered sugar, perfectly accompanied by a cup of café au lait. The beignets are fresh and hot and the aroma is heavenly. As you sit in this open café look around you. This is a perfect place to see some of the fun sights of New Orleans. Across the street, you'll see an absolutely motionless mime, painted in silver, perched on a box ready to perform. Several carriages pulled by mules adorned with flowery straw hats are parked nearby, available for a ride through the historic French Quarter. After you have savored this treat for the senses, stroll past the street entertainers and climb to the top of the levee. You're now in Artillery Park with a wonderful view of the crescent in the river that gave the city one of its nicknames, The Crescent City. There are benches in this small park from which you can get an entirely different view of the oldest part of the city. If you want a closer look at the river, cross the parking lot on the river side of the levee and go out to the area New Orleanians call the "batture." Here you will find steps going down to the river. Locals call this walkway the "Moon Walk" after a former mayor Maurice "Moon" Landrieu. 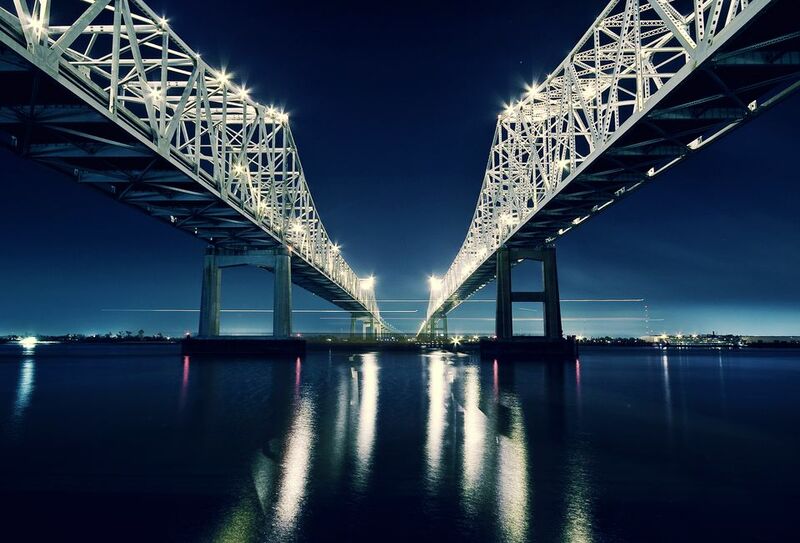 To the right of the Moon Walk, you will see the Crescent City Connection, a bridge spanning the east and west banks of the city. Walk toward the bridge through Woldenberg Park, a linear park that runs along the riverfront. In Woldenberg Park you'll find bandstands with music and sculptures. Look for three favorites: "Old Man River;" the monument to immigrants who passed through the port; and a memorial to the Holocaust survivors. Stop and sit on one of the many benches and watch the muddy waters flow by while the calliope on the Steamboat Natchez toots out a version of "In the Good Old Summertime." Near the end of the park is the Audubon Institute's Aquarium of the Americas and IMAX Theater. On a summer day, duck into the air-conditioning for some cool (in every sense of the word!) fun with clownish penguins, and the world's largest and most diverse collection of sharks in the world. For the more adventurous there is a chance to pet a baby shark in a touch pool. Here, all along the river, are cruise ships for every taste and budget. A multiple-day adventure in old world riverboat elegance, or a two-hour cruise to a historical battle site, are only two of the options. A good way to spend the day if you have the children along is to see the aquarium, then take a riverboat ride upriver to the Audubon Zoo. Just past the aquarium is Canal Street, the downtown district's major thoroughfare that starts at the river. If you want a different view of the river and don't want to spend any money, take the free ferry at the foot of Canal Street. It leaves every 15 minutes for a ride across the river and back. If you decide to stay on land, there are some interesting choices. If you're a gambler, Harrah's 100,000 square foot casino is at the foot of Canal Street, just a short walk from the aquarium. If you prefer to shop, the Riverwalk Mall is on the wharf just beyond Canal Street. Before you go into the Riverwalk, stop and cool off on one of the benches around the cascading fountain at the Spanish Plaza located in front of the mall entrance. A small open-air bar in the Plaza often has live music. In the late afternoon or early evening, this is a favorite spot to enjoy some free entertainment and a cool breeze while sipping a Cosmopolitan. Inside the Riverwalk you'll find three levels of shops and eateries to enjoy while strolling jazz bands liven your mood. When you first enter the mall you will notice stairs just beyond the information booth. They lead to the Hilton Riverside Hotel which has a great sports bar if one of your party isn't a shopper. This first level has a beignet stand if you need another fix, and, if you drove, you can get your parking ticket validated at nearby Butterfield's. Follow your nose to the Fudgery on the third level. The comic candy-making demonstration is almost as good as the finished product. Restrain yourself from jumping over the counter and blowing your diet because of the scrumptious aroma. Continuing on through the mall to the far end (Julia Street entrance) there is a food court offering lots of local fares. Try some seafood from Mike Anderson's or spicy chicken from Popeye's. When you've made your selection, go outside to eat. Along the water, there are tables and close-up views of large cruise ships. If you're in town during Jazz Fest or any other big festival, you're likely to see the moored yacht of some international celebrity bobbing in the river. Whether you have an hour to kill between meetings, or a day of leisure with your family, the banks of the Mississippi River at New Orleans will provide a fun and interesting experience.